Electric Pressure Cooker Mississippi Chicken Noodles - Recipes That Crock! Are you looking for recipes for your Ninja Foodi, Instant Pot or Crock Pot Express electric pressure cookers? 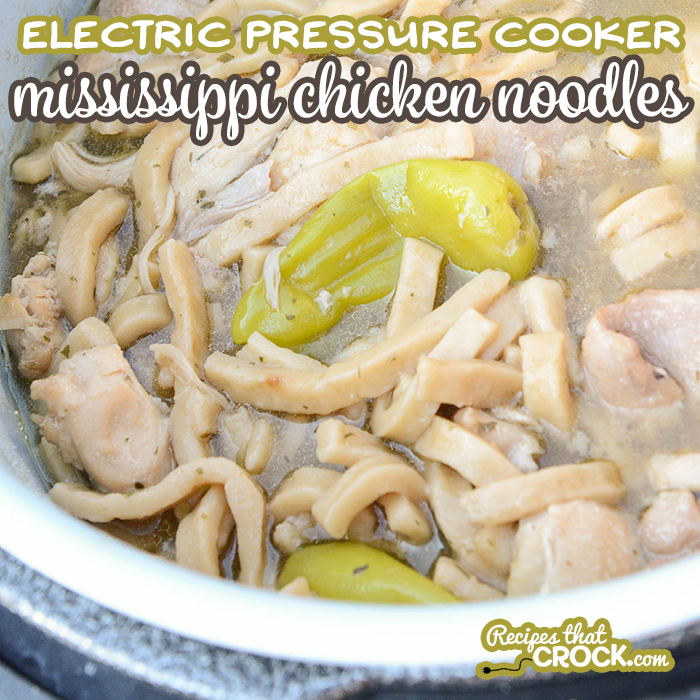 Our Electric Pressure Cooker Mississippi Chicken Noodles recipe is a super simple comfort dish ready in minutes! I am so excited to finally get to share with you this super simple dish that is one of our favorite Ninja Foodi recipes! 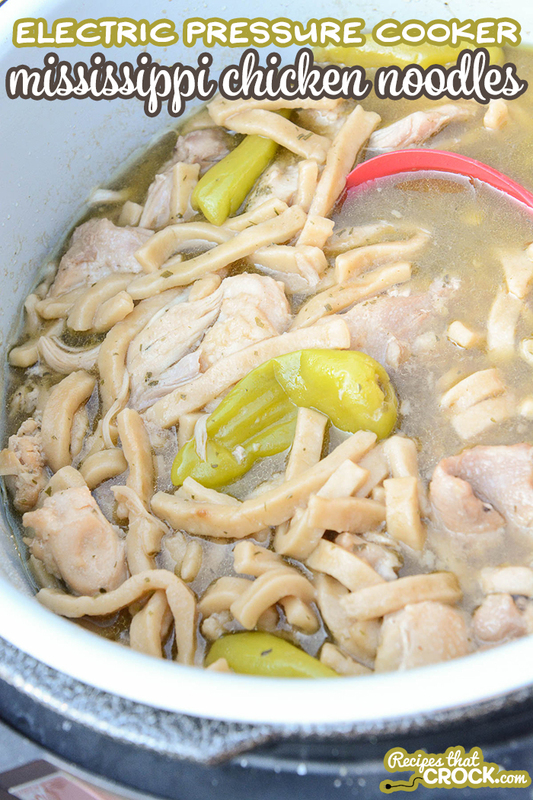 I love that you can take frozen chicken AND frozen noodles and toss them all in any 6 to 8 quart electric pressure cooker under pressure for 10 minutes and come out with the perfect comfort dish! We love to use Reames Egg Noodles in our dishes. Readers often ask where to buy frozen egg noodles. You can usually find them near the other frozen pastas or breads in the freezer aisle. Here is a link to find the egg noodles we use. 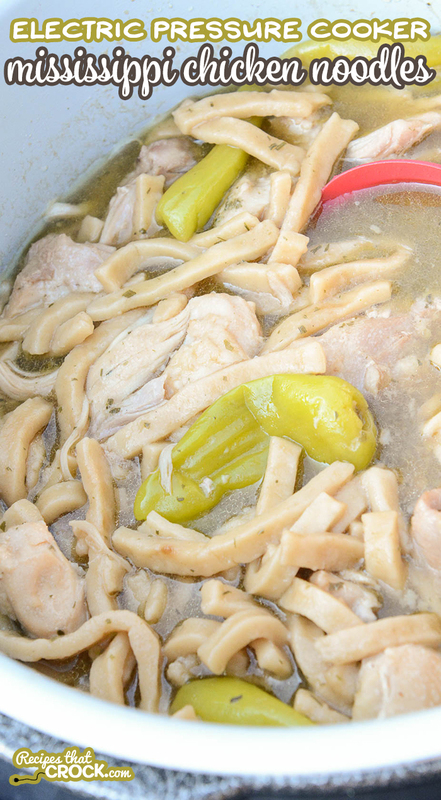 If you choose to use dry noodles instead, I would put them in first on the bottom and make sure they are completely submerged in the liquid under the chicken. If any noodles do not fully cook after pressure, just flip to saute and boil with lid off until they become tender. Or, you can wait to add the dry noodles after you release the pressure and remove the lid. Just switch to saute and add noodles. Boil until tender. This is a recipe that we have tested in our Ninja Foodi but you should be able to make it in any 6-8 quart electric pressure cooker, including the Instant Pot and Crock Pot Express. If you are looking for more Ninja Foodi Recipes, you can find them here. You can also make any of our Instant Pot Recipes and Air Fryer Recipes in the Ninja Foodi. Cooking times are always a basic guideline and should always be tested first in your own unit and time adjusted as needed. Place frozen chicken in the bottom of a 6-8 quart electric pressure cooker. Add noodles and remaining ingredients. Place under high pressure for 10 minutes. Naturally release for at least 15 minutes. Quick release after that if desired. Stir and serve. What adjustments would I need to make if I used thawed chicken? My lovely Wife and I just made this today and all we can say is Yummy! We were able to find the frozen egg noodles, my advice on that is when looking in frozen section look in the area with chees toast and you should see other pasta items as well. Take the time to look as it is so worth it. This is a very good hearty chicken noodle soup. We are deffently keeping this as a go to recipe. If you haven’t tried anything with the Mississippi Mix yet, give this a try you will not be disappointed. After this awesome dish you will want to try everything with it lol. Thank you again Cris for sharing! I made this tonight and it was excellent! I did not have the frozen noodles on hand, so I cooked everything except the noodles, and when the chicken was done and shredded, I just turned the pot to saute and tossed in half a bag of egg noodles and let them boil for about 12 minutes. I stirred everything well and dished it up….delicious! Thank you!